December 12, 2018 -- Clinicians can use as little as 10% of the conventional FDG dose and still produce diagnostic-quality images to detect breast cancer using a time-of-flight (TOF) imaging technique with PET/MRI, according to a study published in the December issue of the Journal of Nuclear Medicine. Researchers from Switzerland, the U.S., and Canada used five image reconstruction scenarios with varying amounts of FDG and found that TOF PET images with only 10% of the standard dose of the tracer were sufficiently adequate in terms of image quality, sharpness, noise, and lesion detectability. Concurrently, the reduced dose would bring the radiation burden for women with breast cancer to less than what they would receive from a single digital mammogram. "Having the possibility of reducing the amount of injected tracer for specific indications will significantly reduce the radiation burden of patients, potentially resulting in a paradigm shift in PET imaging," wrote lead author Dr. Bert-Ram Sah from University Hospital of Zurich and colleagues. "A reduction of injected dose as presented in our results will render partial-body examinations with PET/MRI justifiable." PET has long been a primary modality in detecting many cancers, but it also has the downside of radiation exposure for patients. More recently, newer PET imaging techniques, such as time-of-flight imaging, have lessened the need to increase the tracer dose to improve image quality. In addition, the advent of silicon photomultipliers (SiPMs) on PET scanners has improved sensitivity compared with conventional PET/CT and PET/MRI scanners, so users can better balance dose reduction with image acquisition time, the authors noted. The question is: What is the minimum amount of tracer -- in this case, FDG -- that will provide clinically useful images? To that end, Sah and colleagues analyzed 26 consecutive women (median age, 51 years; range, 34-83 years) with confirmed cases of breast cancer. Most of the patients were diagnosed with invasive breast cancer (19 cases, 73%). There were 36 primary breast lesions (51%); 26 lesions (37%) of the axillary, hilar, or internal mammary chain lymph nodes; and nine lesions (13%) of the bone, lung, or abdomen (JNM, December 2018, Vol. 59:12, pp. 1817-1822). The patients fasted for four hours before intravenous injection of 3 to 3.5 MBq of FDG per kilogram based on body weight. Clinical TOF PET/CT (Discovery 690, GE Healthcare) was performed approximately one hour after tracer administration. No additional FDG was given for the PET/MRI scan. The mean uptake time for the 20-minute PET image acquisition was 34 minutes (± 6 minutes). TOF PET/CT scans followed clinical oncologic imaging protocols before imaging on a simultaneous TOF PET/MRI scanner (Signa PET/MR, GE) with an eight-channel breast coil. There was a mean time of 38 minutes (± 3.5 minutes) between the start of image acquisitions. The PET/MRI protocol included Dixon-based MRI acquisition for attenuation correction and a dedicated breast MR imaging protocol for diagnostic purposes. 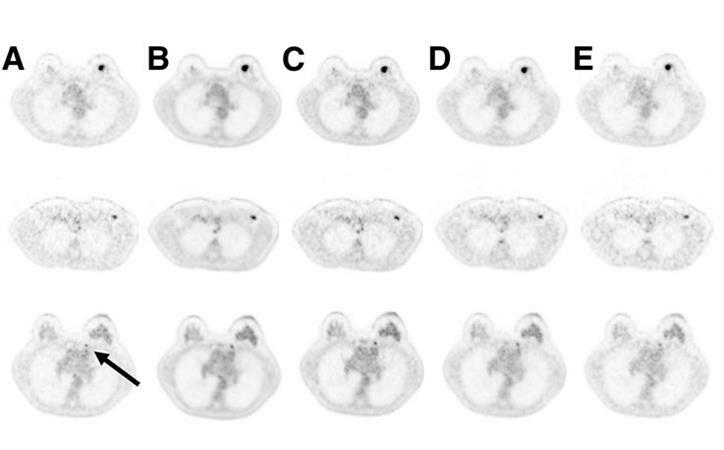 To evaluate TOF PET images at different doses, the researchers reconstructed the 20-minute PET acquisition time for each patient into five different image sets. They began by reconstructing the first two minutes of the scan with three iterations and 28 subsets to use as a standard of reference and for comparisons. They then followed with image reconstruction simulations with FDG dose amounts of 100%, 20%, 10%, and 5% for the clinical PET scans in the 20-minute acquisition time. "In this way, the total scan time remained 20 minutes and, as a result, the data still included normal effects such as decay, biodistribution, and eventual patient motion," the authors wrote. The process created a total of 130 reconstructed PET datasets, with five different reconstructions for each of the 26 patients. Two nuclear medicine physicians/radiologists with experience in PET and MRI rated the image sets based on image quality and artifacts, image sharpness, image noise, and lesion detectability using a four-point scale (1 = excellent, no artifacts, 2 = good, 3 = average, and 4 = inadequate, marked artifacts). The 20-minute reconstruction with 100% dose rated the best in all four categories of image quality, sharpness, noise, and lesion detectability. The 20-minute reconstructions with doses of 20% (p < 0.001) and 10% (p = 0.001) significantly outperformed the two-minute reconstructions in three categories: image quality and artifacts, sharpness, and noise. Image reconstruction with only 5% FDG dose fared rather poorly when compared with the other higher-dose parameters and proved significantly inferior to the two-minute scan for image sharpness. Mean ratings based on four-point scale, with 1 as excellent and 4 as inadequate. Interestingly, lesion detectability rated as good to excellent in all four dose scenarios, with 100% dose reconstruction significantly better than the two-minute reconstruction for primary lesions (p = 0.38) and lymph nodes (p = 0.001). There also was a statistically significant difference between the 20% dose (p = 0.001) and 10% dose (p = 0.032) reconstructions and the two-minute reconstruction for lymph nodes, but no significant difference in primary lesion detection. Reconstruction with 5% dose was inferior to the two-minute reconstruction, but the results were not statistically significant for primary lesions or lymph nodes. Axial PET images of a 57-year-old patient show invasive breast cancer (top), axillary lymph node metastasis (middle), and internal mammary lymph node (bottom, arrow) after 180 MBq of FDG based on body weight. The images show two-minute TOF (A), 100% of FDG dose (B), 36 MBq of FDG (20% dose) (C), 18 MBq of FDG (10% dose) (D), and 9 MBq of FDG (5% dose) (E). Based on 10% FDG dose, this patient would have an estimated radiation burden of 0.36 mSv. Image courtesy of JNM. So how would exceptionally low-dose PET/MRI scans for breast imaging affect patients' radiation exposure? In this study, the mean full 100% dose of FDG was 225.8 MBq (± 5.5 MBq), which means patients would be exposed to approximately 4.5 mSv (± 1.1 mSv) of radiation. In comparison, the average effective dose for a digital mammogram is in the range of 0.44 to 0.56 mSv. Naturally, less dose means proportionally less radiation burden. Sah and colleagues concluded that a reduction in dose of as much as 90% can produce viable images with less radiation exposure for breast cancer patients. "To date, PET imaging in oncologic examinations is restricted mainly to whole-body examinations in patients with different cancer indications," the authors wrote. "This restriction was somewhat justified by the radiation burden in the current clinical setting (5-15 mSv for a PET/CT scan). With the results of this study, this restriction might be reconsidered."